Passwords being cracked by some really simple python code I wrote. Who knew ‘Tigger’ was such a common root word for passwords? A few weeks after launch, you have two million users, and someone breaks into your server and steals the database. Of course, they don’t tell you that they did this; they’re much happier to keep the database, pull out a name and password, log in as someone else, and use your site to steal lots of money and undermine the basic building blocks of democracy and common decency. After sending apologies to the userbase, you decide that your database structure was flawed. LakeHub has been churning steadily along; we had our third event on Saturday, and it was quite successful according to me and everyone else I’ve talked to. We’ve settled on a basic format for the time being, with an event happening every Saturday from 1-5pm. Half of the time these are big group-oriented events with demos and big inclusive activities, and the other half of the time they’re ‘hang-outs’ where people get together to work with other tech-oriented people nearby, and to check in with ongoing study groups. Peter Mbari demonstrates the Arduino at a LakeHub meetup. LakeHub is forming some independent workshop groups, where people can learn a variety of skills in an informal setting. Lately I’ve been spending a lot of time in matatus – the stupidly overpacked minibuses that travel between cities in Kenya – visiting students I’m working with in a few far-flung communities. I’m trying out ideas around teaching students to become self-motivated learners, through the medium of teaching computer programming. (Hypothesis: People who know how to learn independently can go further than those who need teachers. Evidence: Pretty much every effective tech person I’ve met in Kenya.) Programming, of course, is a very hands-on skill, one that you mainly learn by doing it, a lot. So in these three locations, I’ve been giving some basic overviews and leaving the students with resources to work on, and coming back after a week or two to see what kind of progress they’ve made. The question is how to transform students into self-guided learners, given the cultural expectations of lecture-based, teacher-driven classrooms. With the math camps, we’ve been attacking the ‘lecture-based’ part of the formula, by introducing fairly radical beyond-curriculum activity-based methods. But the camps are still ultimately teacher-designed and teacher-driven. In the math camp context, we’re seeking to change attitudes around math education, so that’s fine. But there’s a real question of what happens after the camp ends, and the students go back to the same-old same-old. How can we best foster and facilitate independent learning amongst our students? 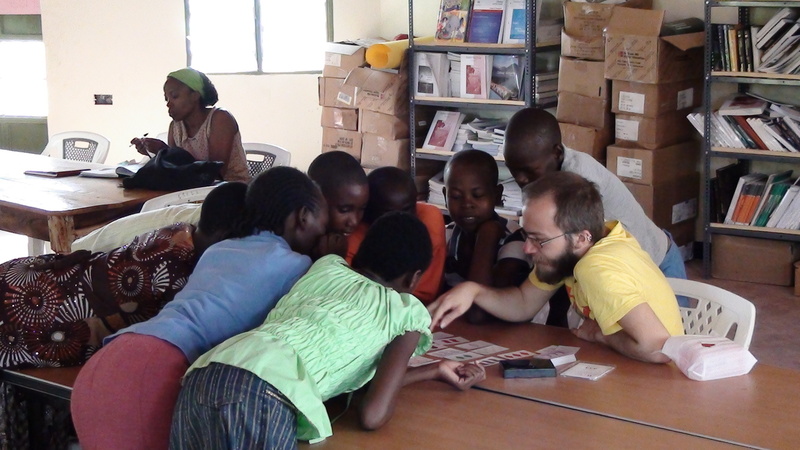 Playing Set with some primary school students at the new Amagoro library. This weekend I took another trip out to Amagoro to meet see the new Amagoro library, opened by a joint effort of Kiwimbi Global and the Amagoro city council. The library opened on February 15th, while I was on a trip to Nairobi, and by all accounts has seen heavy traffic ever since. I set the groundwork to leave a couple Raspberry Pi computers at the library some time after elections; right now they’re still working on getting electricity together. In the meantime I left a Pi with Jevin, the tech-guy for the Elewana project, so that he can become familiar with the system. I also met with three groups of primary school students, about to take their final exams before going on to secondary school. With all of the groups, I talked about how computers work, and the importance of math and computers to all of the various future occupations they were dreaming about, ranging from nurses to engineers. (One students wants to be a ‘computer wizard’ when he grows up!) Hopefully planting some Pi’s with interesting resources will help some of the students get where they want to be.